The ocelot is a wild cat native to the southwestern United States, Mexico, Central and South America. It is listed as Least Concern on the IUCN Red List as the population is estimated to comprise more than 40,000 mature individuals and is considered stable. Its fur was once regarded as particularly valuable, but legal trade of its fur ceased decades ago. In the United States, it inhabits southern Texas and southern Arizona. 3.1.2–3.1/3.1.2.1. The subspecies differ mainly in cranial measurements. The fur is short and smooth; the back is basically creamy, tawny, yellowish, reddish grey or grey, while the neck and underside are white. The guard hairs (the hairs above the basal hairs of the back) are 1 centimetre (0.39 in) long, while the fur on the underbelly measures 0.8 centimetres (0.31 in). The coat is extensively marked with a variety of solid black markings – these vary from open or closed bands and stripes on the back, cheeks and flanks to small spots on the head and limbs. A few dark stripes run straight from the back of the neck up to the tip of the tail. A few horizontal streaks can be seen on the insides of the legs. English naturalist Richard Lydekker observed that the ocelot is "one of the most difficult members of the feline family to describe". In 1929, wildlife author Ernest Thompson Seton described the coat of the ocelot as "the most wonderful tangle of stripes, bars, chains, spots, dots and smudges...which look as though they were put on as the animal ran by." The spoor measures nearly 2 by 2 centimetres (0.79 in × 0.79 in). The ocelot can be easily confused with the margay, but differs in being twice as heavy, having a greater head-and-body length, a shorter tail, smaller eyes relative to the size of the head, and different cranial features. The similar jaguar is notably larger and heavier, and has rosettes instead of spots and stripes. The ocelot is active around twilight and at night and hence difficult to observe. However, it can be seen hunting in daytime as well – especially on cloudy or rainy days. The ocelot is active for 12 to 14 hours every day, and hunting is the major activity. It rests mainly during the day and in a variety of places, such as tree branches, depressions at the base of trees or under fallen trees. Nocturnality in ocelots appears to increase in areas where they face significant hunting risk. The ocelot moves 1.8–7.6 kilometres (1.1–4.7 mi) every night, especially on certain favored trails; males appear to roam twice the distance covered by females. Ocelots in Peru were observed resting for a few hours in the midnight after their walk. Ocelots are known to swim efficiently. They can produce a long-range "yowl" in the mating season as well as short-range vocalizations like "meow"s.
Solitary animals, ocelots live singly in territories that are scent-marked by urine spraying and forming dung piles. Male territories are 3.5–46 square kilometres (1.4–17.8 sq mi) large, while those of females cover 0.8–15 square kilometres (0.31–5.79 sq mi). Ranges of females hardly overlap, whereas the territory of a male can include the territories of two to three females in oestrus. Social interaction is minimal, though a few adults have been observed together even in non-mating months, and some juveniles may interact with their parents. Ocelots also appear in high densities in Peru and Venezuela, where densities can reach 0.4–0.8 per square kilometre (1.0–2.1/sq mi). Barro Colorado Island holds the highest ocelot density recorded: 1.59–1.74 per square kilometre (4.1–4.5/sq mi). This is probably due to higher prey availability, increased protection from poaching and reduced occurrence of large predators. A study suggested that ocelot densities in an area may fall if rainfall decreases. Ocelots are carnivores and prey on small mammals, such as armadillos, opossums and rabbits, rodents, small birds, fish, insects and reptiles. According to studies, primates prevail in the diet of ocelots in southeastern Brazil, and iguanas are the main prey of Mexican ocelots. An ocelot typically preys on animals that weigh less than 1 kilogram (2.2 lb). It rarely targets large animals such as deer and peccaries. An ocelot requires 600–800 grams (21–28 oz) of food every day to satisfy its energy requirements. The composition of the diet may vary by season; in Venezuela, ocelots were found to prefer iguanas and rodents in the dry season and then switch to land crabs in the wet season. 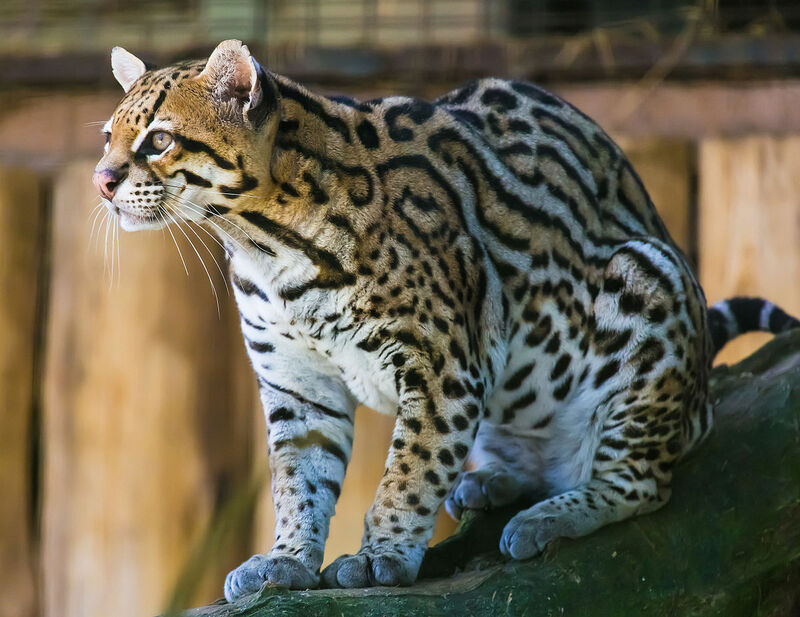 A study showed that ocelots are similar to margays and oncillas in dietary preferences, but the oncilla focuses on tree-living marsupials and birds while the margay is not as selective. Ocelots have been observed following scent trails to acquire prey. Two hunting strategies have been observed: moving at a speed as slow as 0.3 km/h (0.2 mph) on the lookout for prey, or waiting for 30 to 60 minutes at a certain place and then moving to another place, walking at a speed of 0.8–1.4 km/h (0.5–0.9 mph). They tend to eat the kill immediately; they remove the feathers before eating birds. Ocelots may mate at any time of the year, and the time when peaks occur varies geographically – peaks have been observed during autumn and winter in Mexico and Texas, and during autumn in Argentina and Paraguay. Oestrus lasts four to five days, and recurs every 25 days in a non-pregnant female. A study in southern Brazil showed that sperm production in ocelots, margays as well as oncillas peaks in summer. Observations of captive ocelots suggest that a mating pair will spend more time together; both will scent-mark extensively and may even eat less. A litter of one to three is born after a gestational period of 79 to 83 days. Births take place in dens, usually located in dense vegetation. A newborn kitten weighs 200–340 grams (7.1–12.0 oz). A study in southern Texas showed that a mother will use two to three dens, and keep a litter in a den for 13 to 64 days. The eyes open 15 to 18 days after birth. Kittens begin to leave the den at three months, but remain with their mother for up to two years, before dispersing to establish their own territory. In comparison to other felids, ocelots have a relatively longer duration between births and a narrow litter size. Ocelots live for up to 20 years in captivity.